It is a well-known fact that sorting things based on different categories provide for optimum productivity and peace of mind. Placing items into categories guides the purpose of one’s interaction with the environment. Categorization helps to describe an item to others in an organized and particular manner. Categorization comes into play when there is a wide range of choices to choose from. As far as shopping for office furniture is concerned, this range is wide and almost never-ending. 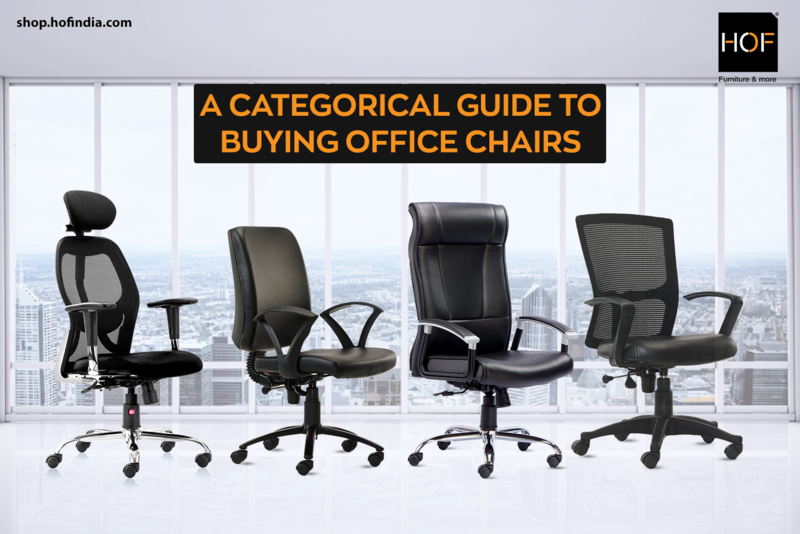 However, in the world of office chairs, there are a few main categories that integrate most other sub-categories. These are Designer Chairs, Ergonomic Chairs, Computer Chairs, Executive Chairs and Visitor Chairs. Designer Chairs: With the rise in urban spaces, homemakers are looking for modern furniture that fit into cramped spaces while adding spice to the ambience. These chairs made of premium quality imported fabric and are designed to suit the needs of every individual while providing a touch of elegance at the same time. The TREYA, JALSA and AARAM are HOF’s designer chairs. Ergonomic Chairs: Workplace injuries can be caused both in offices as well as spaces denoted for work at home if the right kind of furniture is not used. Ergonomic chairs are those that come with adjustable parts to deliver maximum support to the user. Ergonomic office chairs are proven to reduce physical stress and improve productivity by providing adjustments for different body types. The MARCO 1008 and MARCO 1007 are our best ergonomic chairs. Computer Chairs: A computer chair is essential for anyone that sits in front of a screen for duration of up to 6 hours a day. It is designed to offer comfort and convenience by the provision of rest to the main structures of the seater’s body. Most computer chairs are revolving in nature for swifter movements and prevention of strain, along with adjustable headrests. The OLIVIYA 3007 is a great example of a computer chair. Executive Chairs: If you are someone who holds a top position in an organization, these chairs are for you. These office chairs have a variety of features such as tilt mechanisms and lumbar support. Executive chairs are bigger in size compared to regular desk chairs and add a sense of class to the overall vibe of the workspace. They also come with full back support that extends to the shoulder area. The MARCO 1001 H is a popular executive chair. Visitor Chairs: Everyone wishes to make a good first impression on their visitors, especially in an office setting. Visitor chairs are made by keeping in mind the expectations and needs of guests and visitors. These are ideal for placing in waiting rooms and create a lasting visual while bringing in a warm and welcoming feeling. The OLIVIYA 3003 ensures that all your visitors will sit in comfort and style. Like what you read? Get your hands on all these top office chairs and more at shop.hofindia.com NOW!